Chile is a stunningly beautiful country. 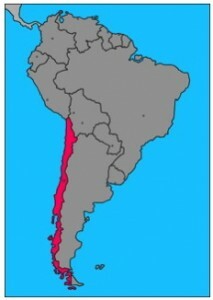 It shares its western region of Patagonia with Argentina. Patagonia stretches to the very tip of the continent of South America. It is a rugged region and is home to one of the world’s dryest deserts – the Atacama Desert that lies high in the Andes. Unfortunately, I have not yet had the opportunity to visit this special part of the world but have been working closely with someone to become involved in an environmental project in the area. It seems that the threat to the beauty and purity of its rivers also comes from mining programs. It is believed that there is great mineral wealth under the glaciers and along the rivers of these Andean slopes. And, like all mining activities, vast quantities of water is needed. The net result of this threat is that pure water is used going into the mining process and contaminated water is discharged. Again, I encourage you to take the time to look through the site devoted to the preservation of this important Chilean watershed. And, if you are able, please contribute to the protection efforts. My story is becoming repetitious: the human assault on our global natural resources at the expense of the ecosystems surrounding the mineral reserves. Please take the time to understand the scope of these preservation efforts. And, if you believe in the causes, then pass this along to your FB connections and share your concerns. Our friends in Chile will welcome our support. This entry was posted in Human Innovation, Water and tagged anthropogenic, climate change, human blunders, inventions/technology, rivers, South America, sustainability. Bookmark the permalink.